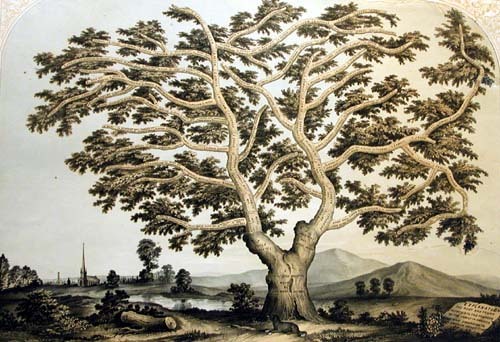 The American Antiquarian Society has a very strong collection of published genealogical material focusing on early North American lines of descent, including French-Canadian genealogies. Currently, the collection numbers over 17,000 family histories, plus 2,000 genealogical reference works. The collection includes some of the earliest genealogies published in the United States: Roger Clap's Memoirs of Capt. Roger Clap (Boston, 1731), which includes a "short account of the author and his family," compiled by James Blake, Jr. Bibles with manuscript notes entered by family members are an excellent and often overlooked source of information for genealogists. The Society has a collection of these Bibles, with access provided in the catalog by family name. 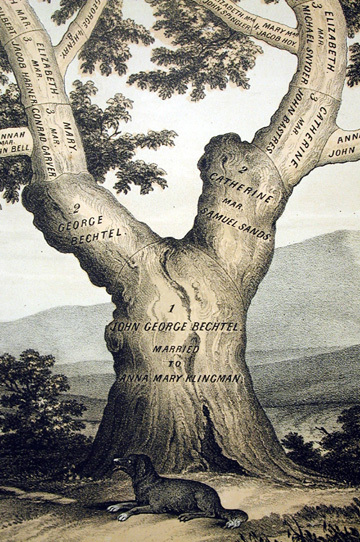 The Society also holds an excellent collection of family trees and genealogical charts, including the Bechtel family tree pictured at right. The genealogies are fully cataloged online in the General Catalog using the Genre/Form term "genealogies". Adding other keywords or limiting by date or place of publication will generate a more manageable list. Digital resources available at AAS include Ancestry, New England Historical Genealogical Society databases, and more, some of which are also available offsite. There are a number of genealogical sources available in microform. Jay Mack Holbrook's Massachusetts Vital Records continues the earlier published records up to 1890 and American Directories produced by Research Publications, Inc. which includes United States directories published through 1880. More information pertaining to the Society's collection of early genealogies can be found in volume 32 of the Proceedings (1922). General genealogical reference materials are available on open shelves in the reading room. The reading room collection includes the 240-volume series of vital records of Massachusetts towns to 1850, the New England Historic Genealogical Register, lineage books published by the Daughters of the American Revolution, Massachusetts Soldiers and Sailors in the Revolutionary War, Mayflower materials, and P. William Filby's Passenger and Immigration Lists Index (Detroit, 1981). Of particular help is the American Genealogical- Biographical Index (Middletown, Conn., 1952-). This series indexes 631 family histories by personal names. The Society owns 591 of the titles indexed, and, to assist reader usage, the consolidated "Key Title Index" to this series has been annotated with the library's call numbers. One reference that is of particular interest for genealogical research in Worcester County is the Works Progress Administration's "A Biographical Index to Worcester and Worcester County" (typescript, 1935). This work indexes ten standard histories by the personal names of the major figures who lived in this area. The Society's typescript "Index to Marriages in Massachusetts Centinel and Columbian Centinel, 1784-1840," and the "Index to Deaths in Massachusetts Centinel and Columbian Centinel, 1784-1840," are two widely used indices that are available in the reading room. The Society also owns a set of clippings of the genealogical column "Notes and Queries," which ran in the Boston Transcript from 1894 to 1941. This is a very good source for genealogical information pertaining to New England for the period 1600-1800. The Society's collection of these articles is arranged in boxes by date of publication, and indexed by name in The American Genealogical-Biographical Index.